St Petersburg (then known as Petrograd ) , Russia. 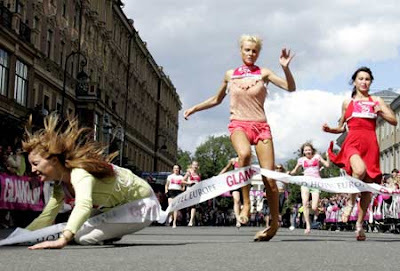 2007 :Women compete in a high-heel sprint in St.Petersburg Some 100 women took part in the race wearing high-heeled shoes with a required minimum height of 9 centimetres (3.5 inches) to compete for a shopping voucher worth 50,000 roubles (about 2,000 U.S. dollars). This is what the restoration of capitalism looks like ! It was a terrible traumatic show! 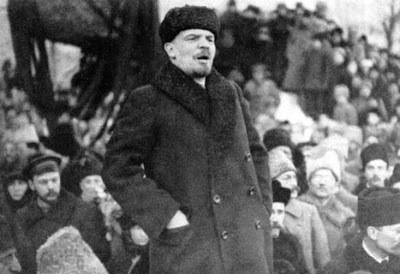 Hovewer I would like to note that capitalism in our country was been restored fifty years ago, during 1950ies, by the Khrushchov clique. Such shows were impossible under revisionism but are it's direct consequences.